Let’s start with the invitations as they set the tone for the party. 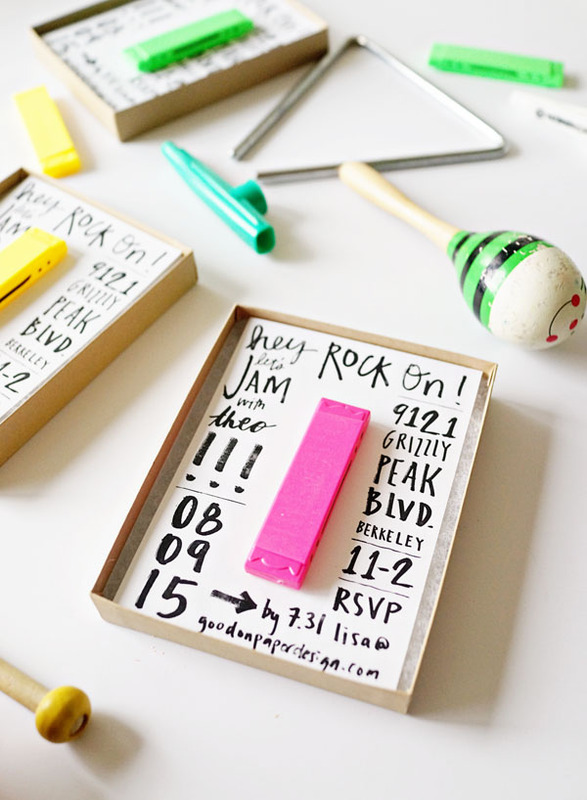 I made these cute invitation boxes that each held a hand lettered invitation and harmonica for our little guests. It was fun to hand deliver them to Theo’s classmates. 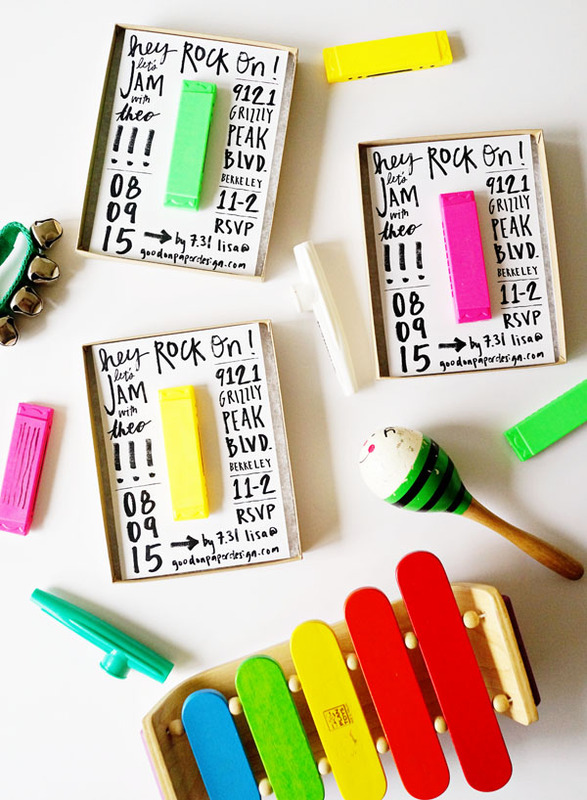 Step 1: Use a Sharpie to hand write the invitation onto 5×7 cardstock and make copies to cut out. Alternatively, you could design and print from a computer. Just be sure to leave about a 1.5″ x 4.375″ space for the harmonica. Step 2: Use a glue dot to adhere a harmonica to the invitation. Step 3: Insert into box and use a Sharpie to write the name or address of each guest. Seal on two ends with neon duct tape. On the back of the box I rubber stamped our return address. Next up are the party favors. I like to give things that are useful, homemade or edible (or a combo!). 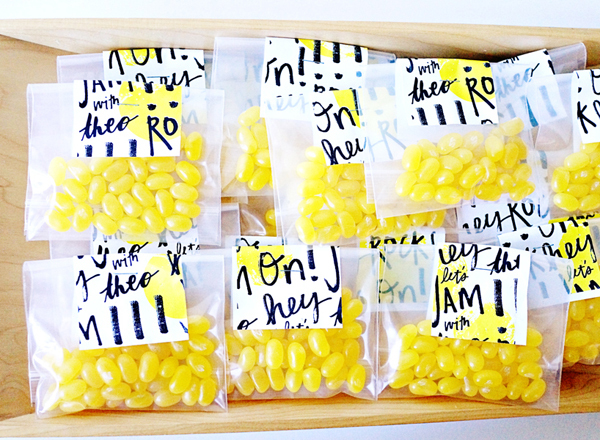 The party favors for Theo’s little friends (4 and under) included a cotton pull bag with a handmade jingle shaker and lemon jelly beans in a cello bag sealed with washi tape. For the older kids, I simply put a handful of jelly beans in a plastic zip bag, and then stapled the top. Step 2: Use the ball pein hammer to carefully create little dimples in the washers. More dimples will create a brighter and more varied sound. The great thing about it is that each washer will be different thus creating unique sounds. 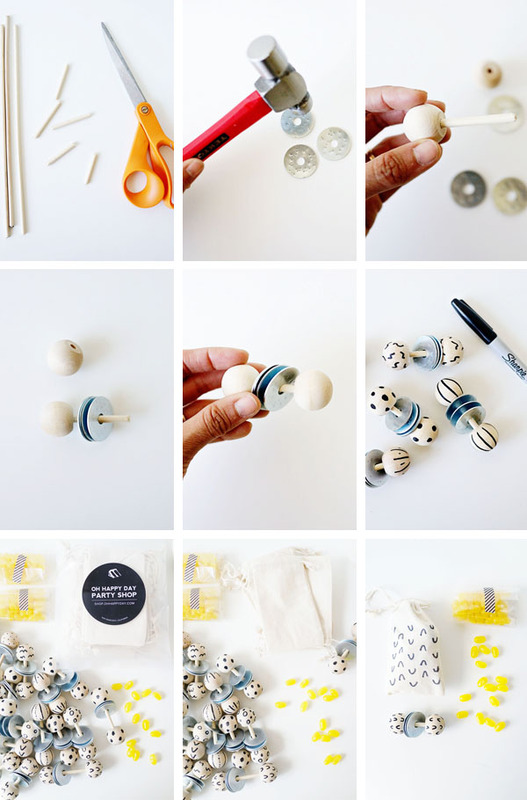 Step 3: Use the hot glue gun to glue a wood ball knob to one end of the dowel. Step 4: Put three washers into the dowel. Step 5: Hot glue another wood ball knob to the end of the dowel. 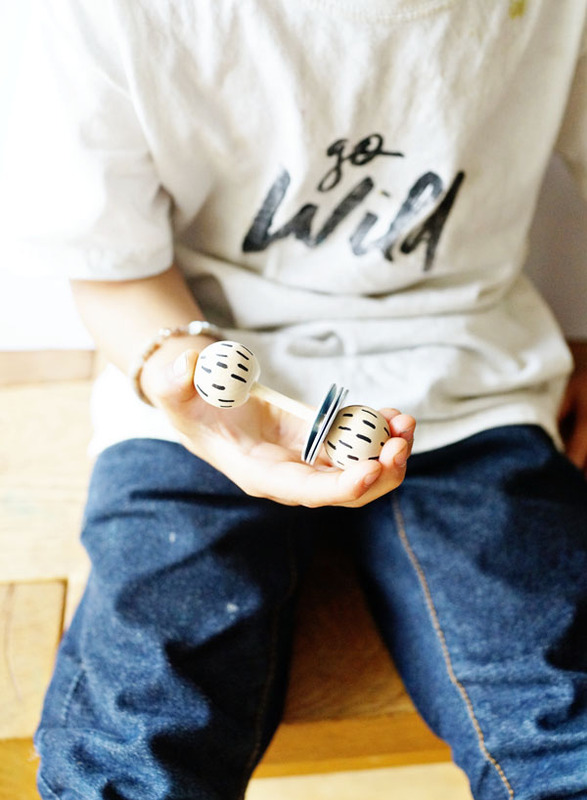 Step 6: Use a Sharpie to decorate the wood ball knobs. I made some simple patterns. Step 8: Put jelly beans (or any other sweet treat) in a cello bag and seal with washi tape. 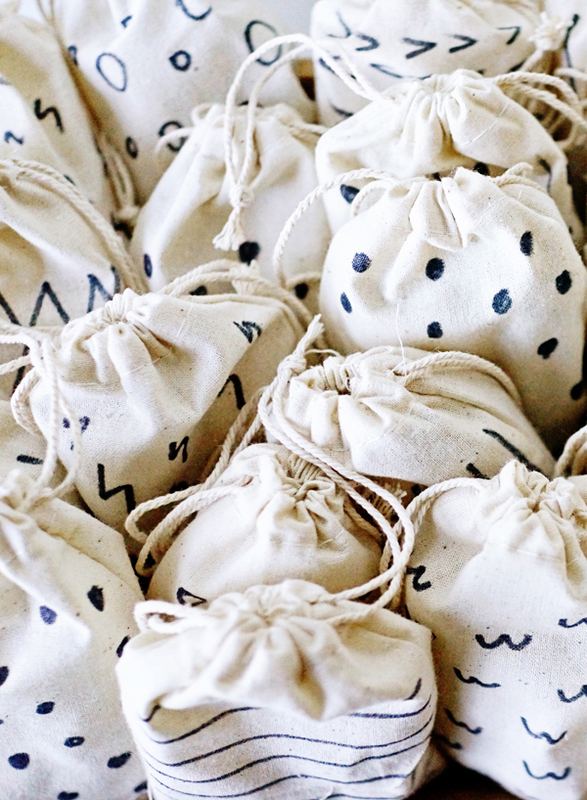 Step 9: Use a Sharpie to draw the same pattern on the cotton bags as the jingle shaker that’s in it. Parties always seem more fun when a photo booth is involved. For my final DIY, I made a simple photo booth with easy and inexpensive music themed props that everyone loved. 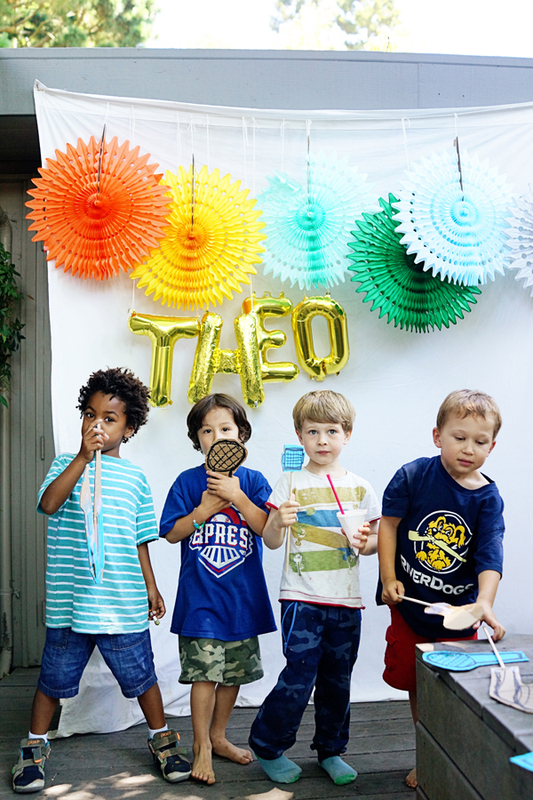 We hung up a white sheet and used tissue paper fans from the Oh Happy Day Shop to create Theo’s “fan club”. 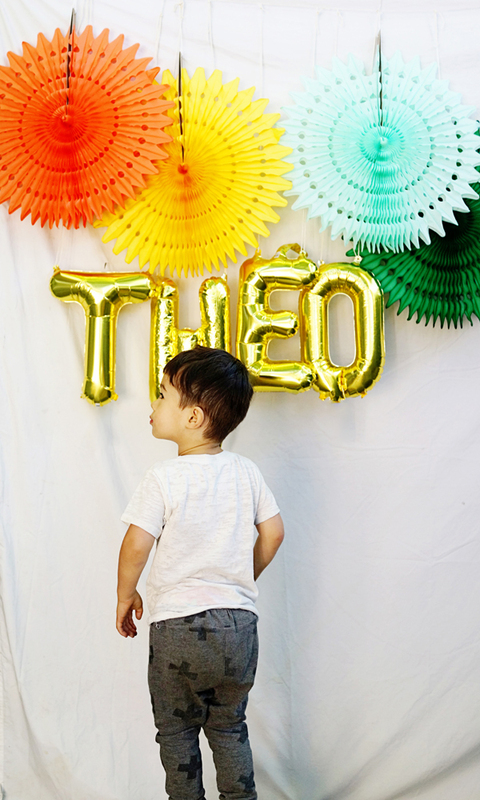 I had guests use an instant camera to snap a photo using easy handmade cardboard props, affix it to an album, and write a birthday wish for Theo. 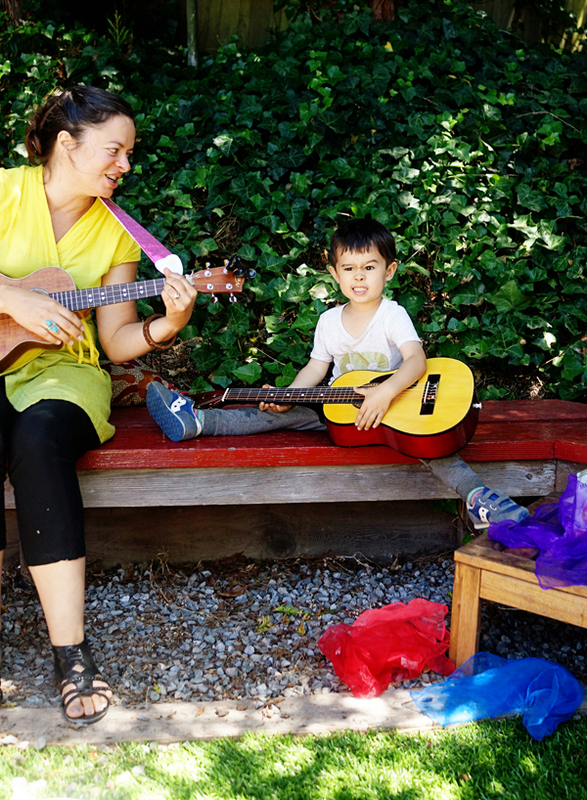 Step 1: Print out the Printable Music Themed Kids Party Photo Props onto colored paper and enlarge instruments as needed. Alternatively, use a Sharpie to sketch out your own musical instruments directly onto cardboard. 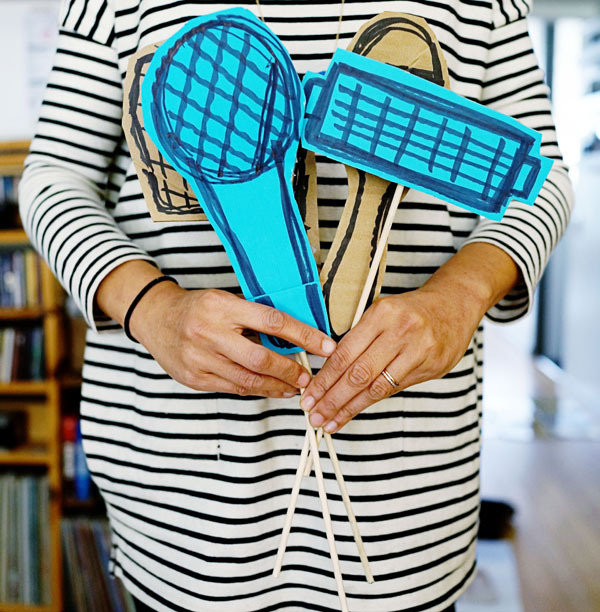 Step 2: If using the printables, use a glue stick or Scotch tape to stick the instruments onto cardboard. Carefully cut around each shape leaving about a 1/4″ border for a fun and rough look. Step 3: Use Scotch tape to affix a dowel to the cutout. I left some of the microphones and maracas free of dowels. If some cutouts seem flimsy, you could tape smaller pieces of cardboard to the back to strengthen them. Step 4: Hang up a white bed sheet. Hang the tissue paper fans from a string at varying heights. 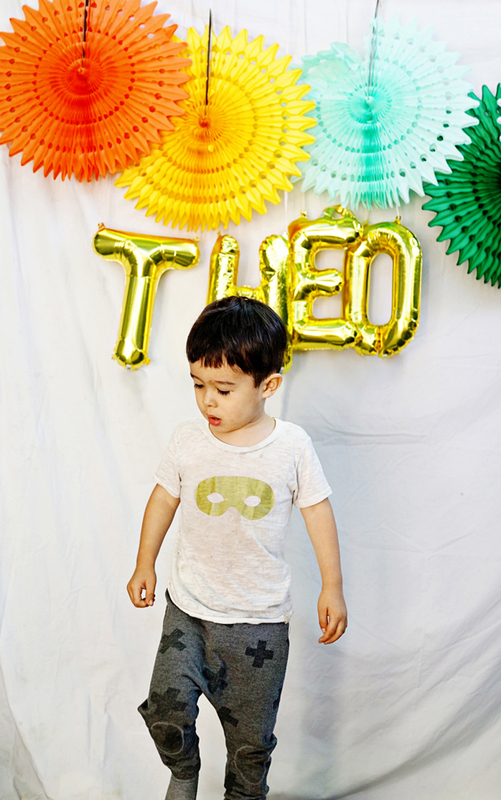 Blow up balloon letters and hang from a string just below the tissue paper fans. Step 5: Grab a prop and have guests snap a photo. Step 6: Affix photo to the album with double-sided tape. 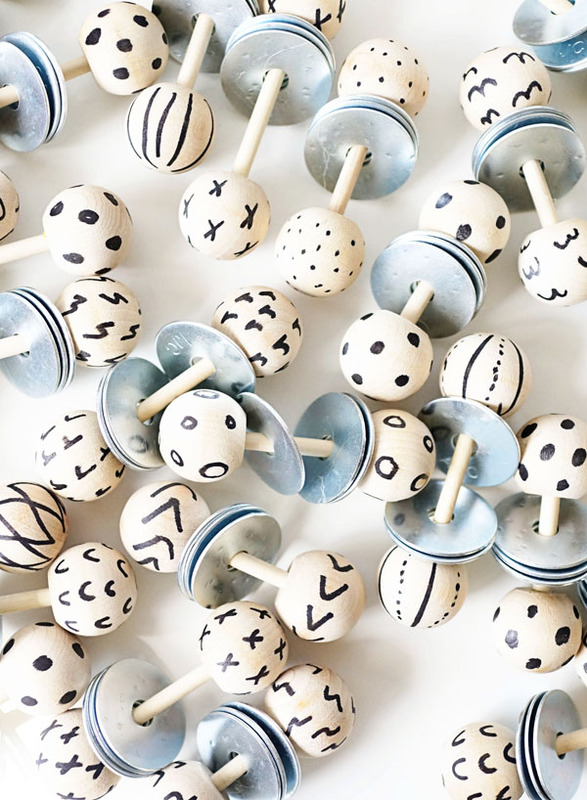 Such a cute theme idea! Thanks Heather! The kids had a blast! It’s wonderful how much effort you put into your son’s birthday party! And you get to live out your DIY passion at the same time! It’s so cute! 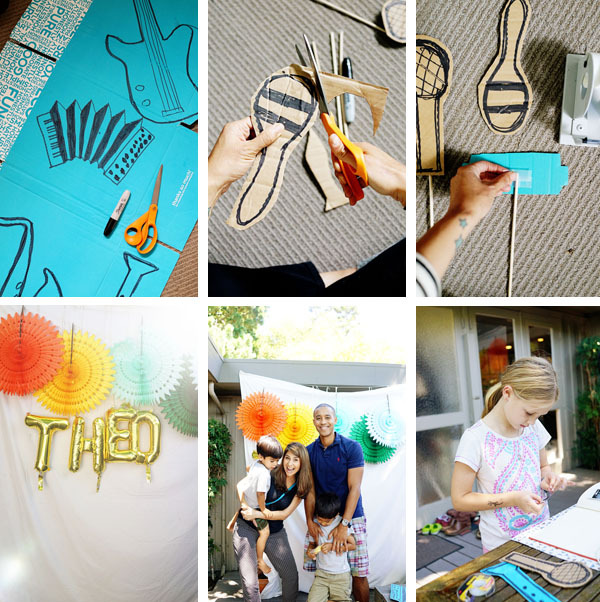 This is such a fun and cute party! You did a great job pulling it all together! Swoon!!! I love this! I’m a new mommie of a beautiful baby boy and this just made me even more excited to plan his parties. I love the colors and modern interest driven theme!